It is commonly believed that chronic pain and other serious disorders require the patient to undergo surgeries and other painful treatments. However, this is untrue. There are some treatment options that are non-invasive. Patients, as per these treatment options, aren’t required to go under the knife or get cuts on their body. One of these non-invasive ways to get treated from chronic pains and other health conditions is shockwave therapy. As part of this treatment method, acoustic waves are sent to the affected part of the body. These rays help to reduce pain and heal the body. To get treated using this form of treatment, schedule a visit to a reputed clinic that offers shockwave therapy physiotherapy in North York. How Does Shockwave Therapy Works? Shockwave therapy breaks down tissues of the body that are injured. It does so by triggering a response to the affected area. This response results in increased blood flow and metabolism in that particular area. Consequently, the natural healing processes of the body get accelerated. It can also to provide immediate relief from the pain. At first, the affected area is identified by palpation. Once the area is identified, it is marked. After that, a contact gel is applied to the skin. It helps shockwave transmission on that particular part. A hand-held piece that is attached to the machine used for shockwave is used to deliver this treatment. It is to be noted that some people may experience pain during this therapy. However, it is generally bearable. In the case when the patient cannot bear the pain, the intensity of the shockwave therapy can be reduced to reduce the discomfort for the patient. Apart from these, it can treat several other muscles, joints, and tendon conditions. Pregnant women are advised against getting this therapy. Furthermore, those people who have an infection on the affected area, they are not recommended to get this treatment. This is due to the fact that there are chances of the infection to spread to other parts of the body. It is known as a lasting treatment since the chances of re-occurrence of the pain or condition treated by this therapy get reduced. There is no surgery, no injection; thus, the healing period isn’t a long one. Even in case of chronic pains, this treatment can prove to be effective as it not only helps to get rid of it but prevents it from coming back as well. Once the treatment has completed, you can carry on with your routine activities without any difficulty or discomfort. In case, you still experience the pain, do not take anti-inflammatory medications as they can react to the healing process. In such a scenario, it is advised to visit a health care center for shockwave therapy treatment, North York. Health care specialist there will inspect your condition and suggest the next action to be taken. With shockwave therapy, collagen production in the body of the production increases. It is basically a building block of the body that helps in healing injuries. As discussed above, shockwave therapy can help to alleviate the pain up to a great extent (72.1% as per studies). Therefore, many doctors recommend their patient to opt for this treatment as not only it provides excellent results but improves the quality of life as well. Shockwave therapy treatment generally consists of 3 sessions that must be taken in 3 consecutive weeks. Each session lasts for 3 to 4 minutes. Typically, in one session, 2500 impulses of shockwave energy are transmitted to the body. Shockwave therapy is considered to be a safe treatment option as there are no side effects associated with it. Some may experience slight pain after the treatment is over; however, it lasts for some time only. This pain is experienced by the patient since the natural healing process of the body is stimulated by this therapy. 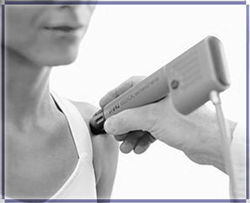 If you are looking for shockwave therapy physiotherapy, North York, the only health care center you need to book an appointment at your earliest is Body Dynamics. Located at Eglinton Ave West, we have become one of the most preferred clinics for people in Toronto due to our professional top of the line services, utmost care, and quality treatment we provide to our patients. A center for quality shockwave therapy treatment, North York, we have a team of experts who are made responsible for helping our patients live a pain-free life. We also provide our services to athletes and sportsmen so that they can recover quickly and perform to the best of their protentional on the ground. All these features make us the most reliable center for shockwave therapy on Eglinton Ave West. For more information, feel free to contact us. Use our live chat feature or call us on 647-799-2686.